I love my Keurig coffee maker. Sure, it’s a little expensive to make coffee one cup at a time, but it’s more convenient and it does taste better and fresher. I grab a mug, I press a button and I have coffee. It’s hard to get easier than that short of placing an order at Starbucks. 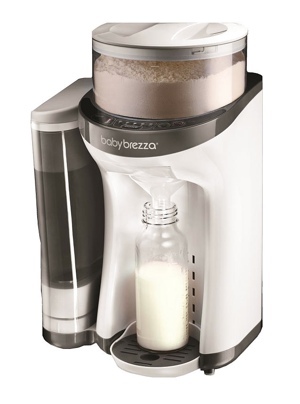 Baby Brezza Formula Pro takes the same convenience of a single-serve coffee maker and applies to making baby formula. On the top of the appliance, you’ll find an air-tight compartment for holding 20 8-ounce bottles’ worth of formula powder. On the side, there’s a 50-ounce water tank that removes for easy cleaning. Once filled, a single button press puts the Formula Pro into action, mixing together the right proportions of water and formula and heating it to body temperature within seconds. The Formula Pro allows you to make different amounts of formula, from 2 to 10 ounces, without any guesswork. It adjusts manually to fit the bottles you already own, so there are no specialty containers to buy. And, there are no single-serving pods to buy either – the Pro works with all formula brands and types. At $149.99, the Formula Pro is definitely a pricey item. But when baby wakes up hungry at 3AM, you’ll be glad that your next bottle is a simple button’s press away. It makes a nice time saver, especially for a sleep-deprived parent. The Baby Brezza Formula Pro is currently available on Amazon and the Baby Brezza website. If you’d like to learn more about the Formula Pro, take a look at the YouTube video below. I have read plenty about how the manufacturer claims this product performs, but would really like to hear from real parents before investing the $150. It sounds like an excellent idea, and I’m more than willing to spend the $ if it performs as it is supposed to, but I’ve found a few negative reviews on some shopping sites. Of course, there will always be issues with owner/operator errors, and of course you can’t please everyone. I guess I’m more interested in some product test results if anyone has come across any.